rything you need to know about our owners and staff! In each post, we will sit down with two to three of our owners and/or staff to answer your burning questions about how we all first learned to stitch, what our favorite projects and stitches are, what other hobby addictions we have, and when you can find us at the shop! First up, we sit down with the Wilson girls and one of the Lennoxes! When & how did you learn to needlepoint and/or knit? After college, I needed a job so I asked to work at the shop. They told me the only way they would let me work was if I learned how to needlepoint. I didn't expect it to become my favorite hobby! My first project was a medium sized floral canvas that had a lot of open background for me to practice the basketweave stitch. Unfortunately, I still don't know how to knit, but I really want to do a large throw blanket in Loopy Mango! I have two favorite projects. My 1st is the belt that my husband wore in our wedding. I had it custom painted by Jude with his schools (Jesuit & Georgetown) and some of his favorite things (Crown Royal, an oyster, and others) and then I stitched it for him to wear on our wedding day. My mom stitched belts for all the groomsmen, as well, and we encouraged all of our family members to wear the belts we had made for them over the years. The groom & wedding party wearing their needlepoint belts. My other favorite project is a large zebra. I did the background in Alicia's Lace Variation and the center of the stitch was metallic, I still love it. It was something different, I used wool on the zebra's body and silk on his face. I had it framed and it is in my stairway still. I like to use embellishment stitches almost everywhere, but one of my favorites is for hair/fur. Santa's beard and coat, voodoo doll hair, even a chicken's hair! It can be turkey work, french knots, anything that adds dimension and texture. My favorite hobby, besides needlepoint, is having cocktails with the shop ladies! I also love to travel, which means i'm usually working on a TSA friendly canvas! Lunch on Mondays and the occasional Saturday. 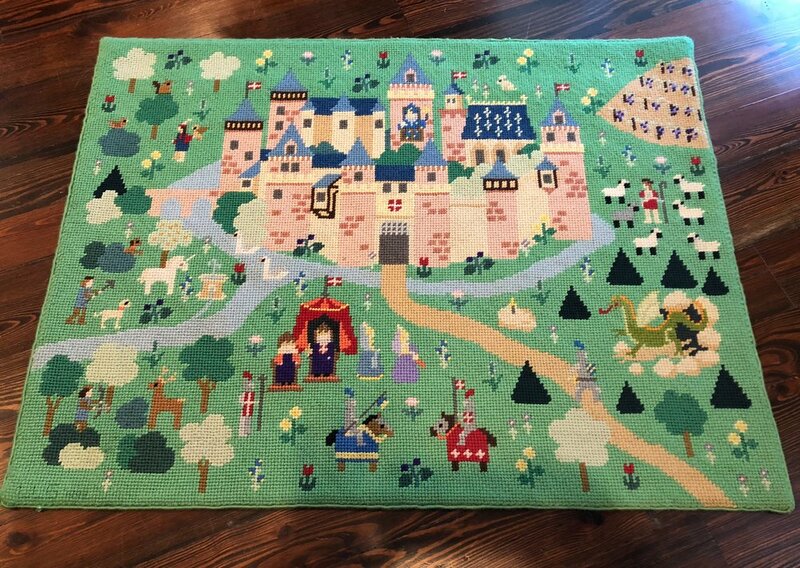 My favorite project is the princess castle rug that I stitched for my daughter Meg's nursery. Me'Me' says that I'm an "overachiever" when it comes to embellishment stitches. If I had to pick my favorite, I guess it would be the Diamond Ray stitch on Christmas trees. Traveling with my daughter is my favorite, but I also enjoy Tequila shots! I am at the shop on Mondays, Wednesdays, & Fridays from 10 - 4 and an occasional Saturday. I learned to needlepoint 33 years ago at NeedleWorks when I wanted to do a stocking for my first daughter. My favorite project is always the one I am working on at the moment. It happens to be a family stocking for my oldest daughter. It is actually a companion stocking that goes with one I did for my youngest daughter. I am also partial to my voodoo doll and saints player. 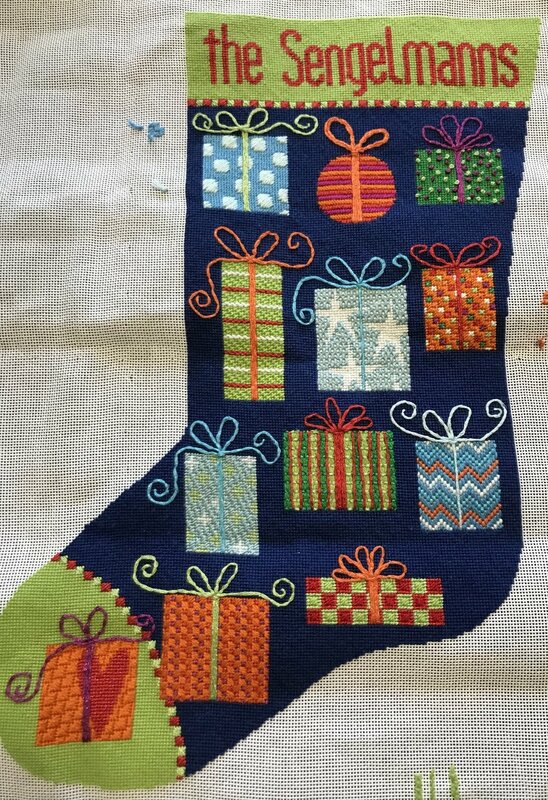 I am not very confident with embellishment stitches, but I did a lot of couching stitches on the stocking I just finished and I enjoyed the process. When I am not stitching I can be found playing tennis or fishing with my husband. But playing Legos and reading with my grandkids is my favorite way to spend the day. I am at the shop 10-4 Monday. 1-4 Wednesday, 1-4 Friday and the occasional Saturday.